This tour is about experiencing lift in the jungle and at the same time having lots of fun. This is a soft adventure tour. We take you from your hotel directly to Kaengkrachan National Park. Take a trip by raft that takes 2 hours. On arriving there, you have a few minutes to cool off in the river while our guides prepare your inflatable raft. We head down river where we stop at the Delta half way down. Here you can pretend to be Tarzan and swing from a rope on the banks of the river into the water. We continue on to the Tanu Resort where we disembark to have some lunch. You have the possibility of trying to jump off a 4 or 5 meter-cable line into the river if you are brave enough. A sort of a mini bungy jump! After lunch we head off to the Reptile Park with over 100 crocodiles to see snakes and a crocodile show. Then return to hotel. River Kwai is our most popular tour. Takes approximately 3-hour drive. We start with a visit the war cemetery where over 6000 Allied soldiers are buried. On to the JEATH War Museum, where you can see the displays from the II World War all housed in a Bamboo Hut. We then embark on a boat trip that takes us up river to the River Kwai Bridge. We disembark and trek up to the railway station where we take an unforgettable train journey which takes us through thick jungle and along narrow mountain passes before we arrive at the Wang Po Jungle station. Just by the station, we settle down for a well deserved lunch consisting of a fine European and Thai Buffet. After resting a while we visit a cave that was used as a hospital during the war. Then it's on to an Elephant camp to observe the demonstrations and enjoy a ride on these magnificent beasts. Return to Hua Hin and back to your hotel. Depart early in the morning at 0600 hrs heading towards Damnern Saduak which takes about an hour. 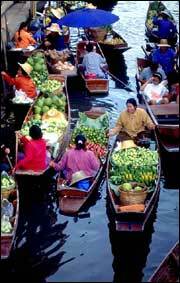 On arrival, we take a leisurely walk towards the river where you will see hundreds of long tail boats selling local produce, fruit, vegetables, souvenirs and locally made Thai noodle soup. You can walk down the side of the river but the best way to see the floating market and it's surroundings is by long tail boat, which your personal guide will be more than happy to arrange for you at a small additional cost. We then move onwards towards River Kwai. See Tour River Kwai Tour for details of this tour. 1) Elephant and Crocodile wrestling show in Samphan Zoo, which has the world's largest crocodile population. The national park stretches over the sea, beaches, islands and mountain ranges. Start by a visit to a pineapple plantation. Then on to a coconut farm where they train monkeys to fetch coconuts. After that visit the monkey temples and take the river boat on a romantic and exiting tour through the mountains. Lunch is prepared for us. After this to the boat which will take us to the beautiful Laen Sala beach. We trek up to a huge cave where there is a remarkable pavilion. The closest place where you can enjoy some excellent snorkeling, in clear blue waters just south of Hua Hin only a two hours drive from here. We depart early leaving at 0700 hrs. On arrival at Bang Saphan, we take a voyage on a speed boat which takes us to some magnificent corals where we stop for some snorkeling. We then move on to another spot where we snorkel some more, this time with a lot of fish who come right up to you nibbling at your fingers for some food. Later we set anchor at the island of Koh Talu where we have lunch. 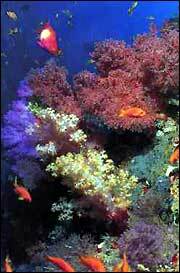 You have free time to do some more snorkeling, swimming, exploring the island or just laze by the beach. Return back to Bang Saphan where we break for some well deserved tea / coffee & fruit before continuing the journey back by bus. On this tour we first visit a pottery which is famous for it's earthen pots which are exported all over the world. From here we head on to Wat Mahatat Temple located in the center of Ratchaburi town. The temple is famous for it's numerous paintings depicting the history of Thailand. The temple is constructed in Khmer style decorated with sculptures and stacco. The main dome is very high and in the shape of a stalk of corn. There are four smaller domes around the main dome. We then head on to the bats cave just before sunset and await the awakening just a few meters from the entrance. You will not believe your eyes as the bats awake and go out hunting, exiting the cave at once. There are over 4 million bats and they form a trail of black in the sky a few kilometers in length. We return back to Hua Hin and to your hotel at around 1930 hrs. The trip to Petchaburi takes approximately 40 minutes. We stop half way at Tha Yang and visit the Thai Sweet shop where they make traditional Thai desert famous all over Thailand. Get to know and taste all the deliciously sweet and colorful candy made from coconut, palm and different tropical fruits in the old traditional way. We move on to Petchaburi where we visit King Rama IV Palace. Access to this palace is by cable car and which is located on top of a hill over looking the town of Petchaburi. We move on to Wat Khao Luang Cave. It is divided into three sections with images and idols of Buddha presented by His Majesty King Bhumipol. The main section of the have is huge and has an opening where natural sunlight seeps into the cave. We stop for a lunch and favour local dishes at a pre-arranged restaurant by the sea. Later we visit the temple of Wat Mahatat. After this we return back to Hua Hin. If you like white sand, blue water and beach - you have found heaven. Koh Tao and Koh Nang Yuan offer sun, sea and sand for all whether you prefer a bit of action or just like to laze sunbathing. Sairee Beach is a long beautiful curved beach, stretching 2 miles. Palm trees and vegetation on the coast make it a perfect spot for snorkeling enthusiasts and divers, since the coral reef starts just 100 meters off the beach. Transportation: Express boat operates daily between Chumphon and Koh Tao. All passengers have being covered by extensive insurance. Bus service with a fleet of air-conditioned mini-vans and a large VIP bus, we take you there in comfort and style. Bungalows : private with wooden or bamboo bungalows on the beach in tropical gardens with fan or air rooms.